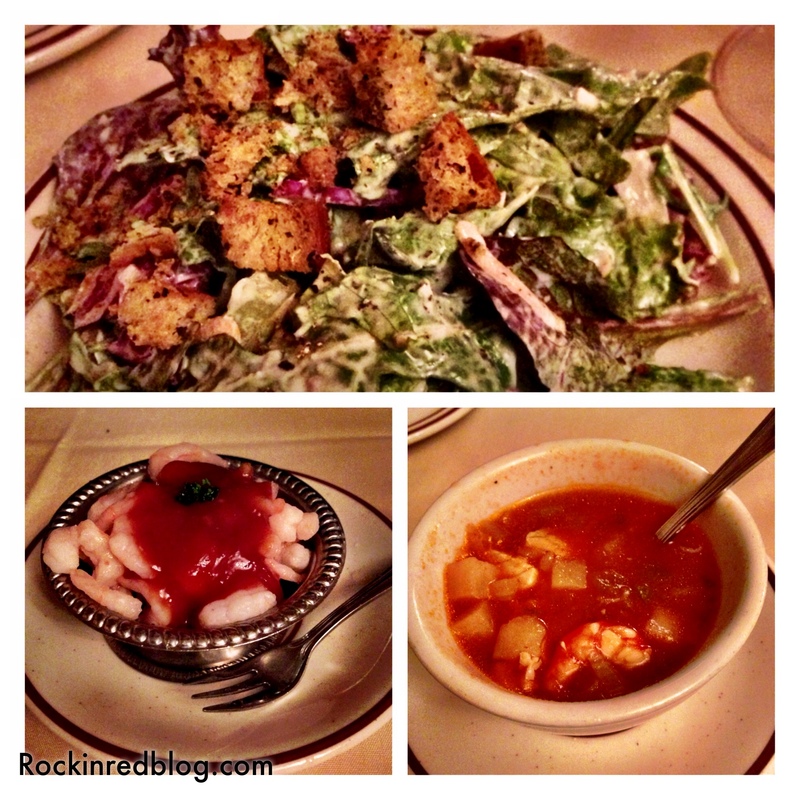 One tourist thing I really wanted to do with my husband while in Santa Barbara County was dine at the Hitching Post. I am not a super big touristy person; I like to see all the cool sites but usually the locals know the truly best ways to experience their area. So it was great when the Hitching Post was also recommended to us by locals; in fact, most of the daily diners who frequent this restaurant are locals. 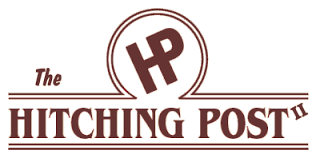 To further tip the scale in our favor, the Hitching Post II was literally a 2 minutes’ drive from our hotel. Heck, if we had over-indulged in their wine would could have walked back to our room! Alas, we wined and dined and made it back to our room without a fuss. Furthermore, I found out from a local that the Hitching Post II (opened in 1986) is actually the restaurant featured in the movie Sideways and since it is located in Buellton in the Santa Ynez Valley (as opposed to the original in Casmalia which opened in 1952 and is much further away) it is the more popular location of the two. 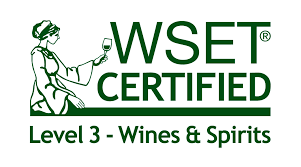 To learn more about Frank Ostini’s, owner and executive chef of Hitching Post II as well as co-owner of Hartley Ostini Hitching Post Wines, perception and experience in the movie sideways click here. Purely coincidentally late in the same afternoon we had an awesome wine tasting experience at Loring Wine Company (keep a look out for that upcoming article), which is located right next door to the Hitching Post II. 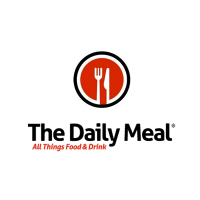 The staff at Loring said they dine their frequently and really enjoy it. The sign outside the HPII claims they serve the “World’s Best BBQ Steak!” Now we are from Texas; we eat a lot of great bbq and a lot of great steak but we had never heard of BBQ Steak! So my husband inquired at Loring about this phenomena and our minds and palate were put to rest. Apparently HPII uses a special rub on their meats before they grill them. OK, so it is beef with a delicious dry rub; not smothered in bbq sauce. Got It! Oh, and their recommendations: artichokes, steak and the HP Highliner Pinot Noir! As we walked in at 7pm on a Sunday evening the place was full of people and bustling with activity. The wood paneling walls and dusty rose colored accents was a throwback to the 70’s – 80’s. My husband, who grew up in Wisconsin, said it reminded him of the “supper clubs” they would attend for dinner on a Friday night. 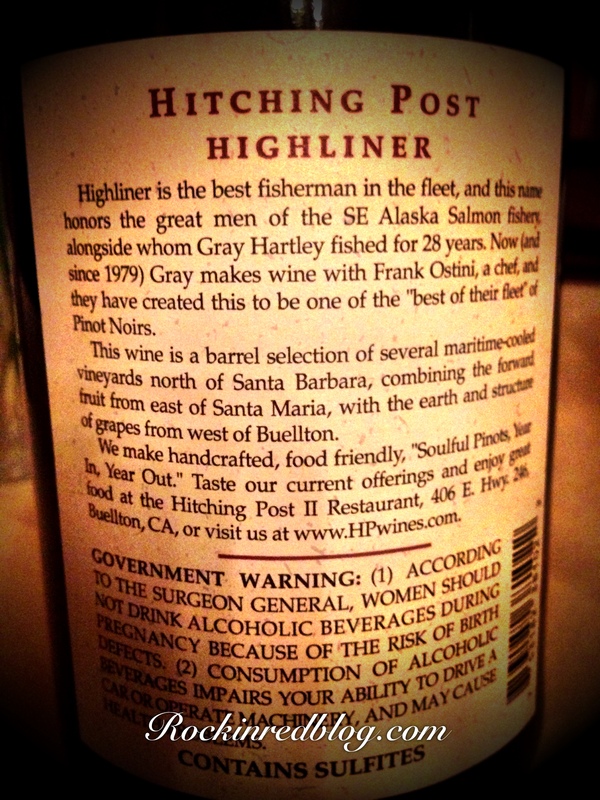 Hartley Ostini Hitching Post 2012 Highliner Santa Barbara County Pinot Noir: We began our evening by ordering this lovely wine. It poured a medium ruby into the glass and opened with inviting aromas of black and red berries and spice. On the palate this elegantly restrained Pinot Noir delivered flavors of black raspberries, blackberries, red raspberries and cherries along with anise, spice box and a lingering touch of toasted cedar and a hint of minerality giving it a satisfying grit. This wine was light in weight yet full in flavor with well-structured acidity and restrained tannins that offered a clean finish. The Highliner is the top vintage from Hitching Post wines; therefore, the best barrels from the best vineyard to craft this Pinot Noir. SRP $48 at restaurant/ $42 from web site. Click here to purchase this lovely Pinot Noir with a Hollywood background direct from Hartley Ostini Hitching Post Wines web site. 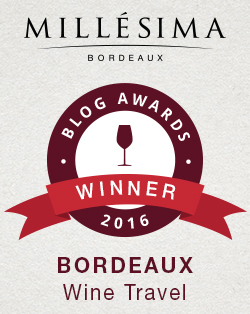 Please note HP has a full selection of wines so I recommend you visit the web site to view their entire portfolio. The first pairing of the evening came with the appetizers. 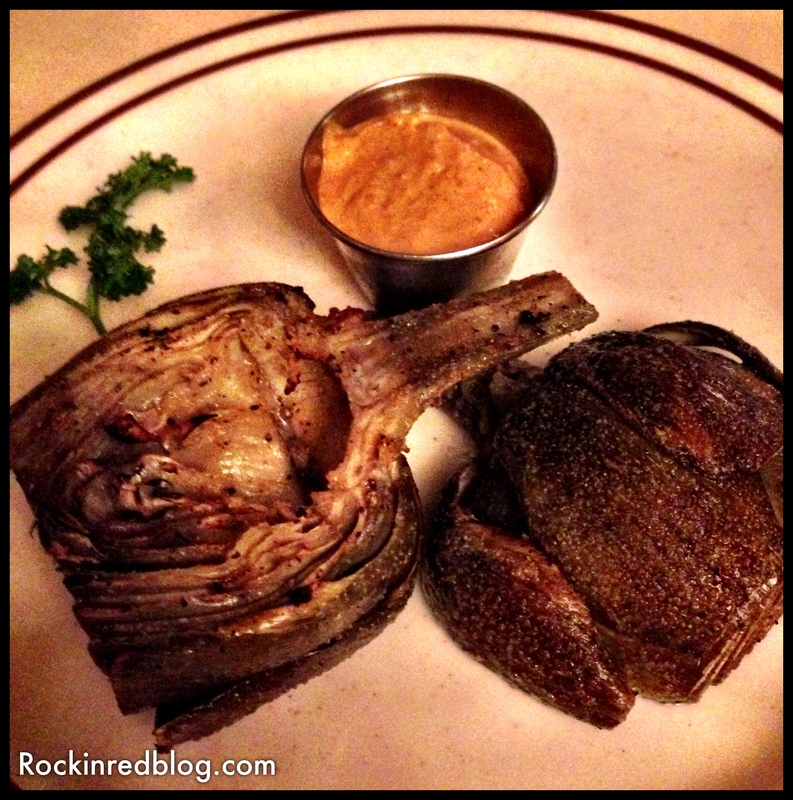 As recommended, we chose the grilled artichokes. Turns out it is their most popular appetizer and I can understand why. Fresh artichokes seasoned with HPII “magic dust” then grilled and served with spicy smoked tomato mayonnaise. My mouth is watering just thinking about it! They were of course outstanding! For our main course my husband and I both selected Filet Mignons. These are served with your choice of soup of the day (fish, that I chose and it was delicious) or shrimp cocktail (my husband’s selection) and a house salad. It was all good. 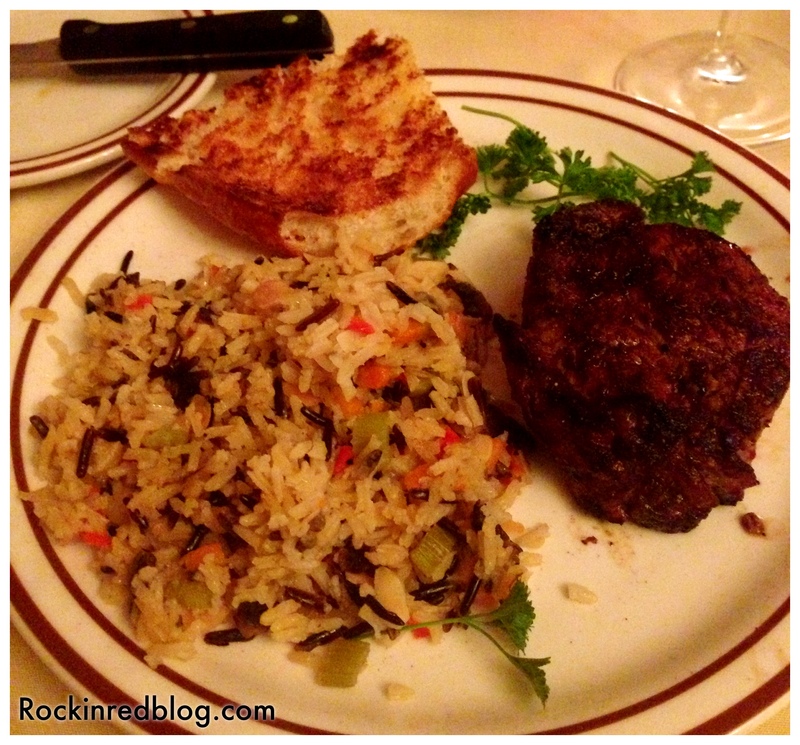 My filet was cooked perfectly, slightly pink, still juicy, and served with rice pilaf and a large slice of garlic bread. Simple, yet delicious. The smokiness of the artichokes and the filet really elevated the toasted cedar flavor of the wine will balancing out nicely with the round berries and spice. It was a great meal and wine pairing. However, it was not over yet. Dessert? Absolutely! 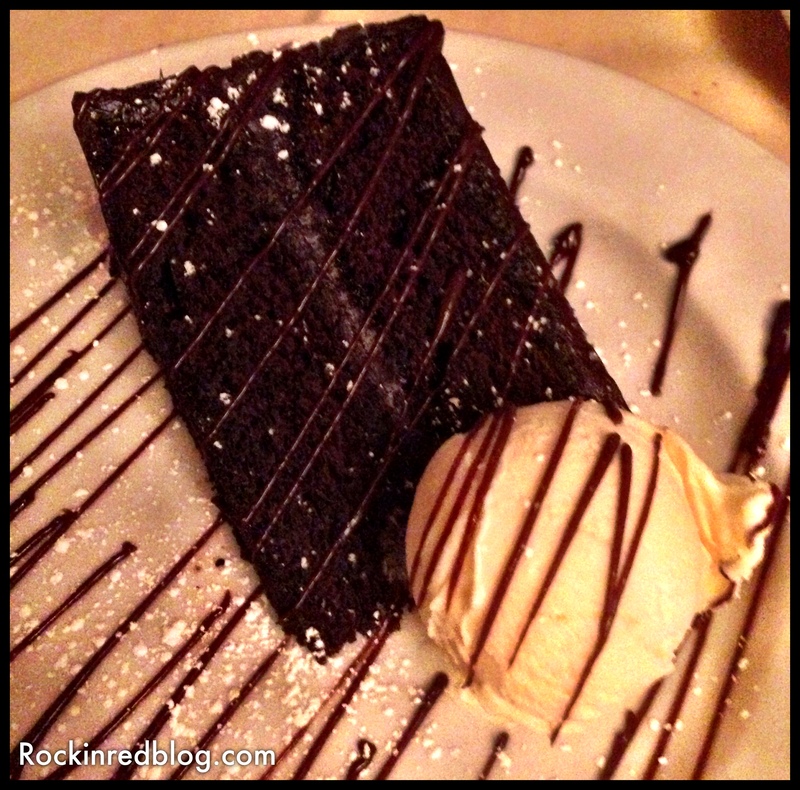 We selected a HPII classic, chocolate cake with vanilla ice cream. A decadently delicious course to conclude an overly indulged dinner. The chocolate cake brought out the spice in the wine and even added a touch of cinnamon to it! Stick a fork in me because I am done! I am so glad we ate dinner at the Hitching Post II. We had a wonderful dinner there; the food was plentiful and delicious, the wine was lovely and the service was friendly, attentive and timely. I would highly recommend a slice of the movie life, better yet, a slice of the Santa Ynez Valley by dining at the Hitching Post II. They do take reservations online so book ahead. They also sell merchandise as well as some of their cooking specialties like the “Magic Stuff;” which I honestly wish I had bought because the artichokes and steaks were so good! Click here to view their store. My Song Selection: The song I have chosen to pair with this article about our dinner at the Hitching Post II is Wine Safari from the Sideways official movie soundtrack. First of all, I like groove going on in this song. Second, we had our own wine safari in Santa Barbara County, visiting Santa Ynez Valley, Ballard Canyon, Santa Rita Hills, Foxen Canyon, The Funk Zone, the Wine Ghetto, Buellton, Lompoc, SBC Urban Wine Trail and Los Olivos, all in three days! We are power winers, power tasters and yes, power spitters. Hitching Post II is one of the many great offerings of Santa Barbara County. Book your own trip to Santa Barbara County and have dinner at the Hitching Post II and let me know what song you would pair with it. Cheers! I feel like I’m enjoying the evening all over again! You were truly power winers! That is a lot in three days but there is so much to see. (and taste) Didn’t you just love the Whine Ghetto? I think the area is amazing,and Los Olivos is a beautiful walking area. So many great wines all within walking distance of each other. We loved it all! SBC is great; Wine Ghetto, Los Olivos, Ballard Canyon, you name it. We are power winers! We tend to be power travelers anytime we visit a place for the first time to take it all in. I think sometimes I wear my husband out! Cheers! We had the most fantastic time at the HPII in the summer and did the full Sideways thing by staying at The Windmill. The Highliner is an awesome wine – I was a bit worried it would be a letdown after the big-up in the film but no way jose!! I remember reading about your trip. I loved your enthusiasm for California. Glad we both found HPII to be as good as expected! Cheers. Our trip to that immediate area was too brief to enjoy HP, but given your sterling recommendation, it’s on the hit list for the next visit. Gotta love that area, but I have to go for more time next time as all we were doing was passing through between Santa Barbara airport and Paso Robles … but had a wonderful afternoon at Fess Parker’s! 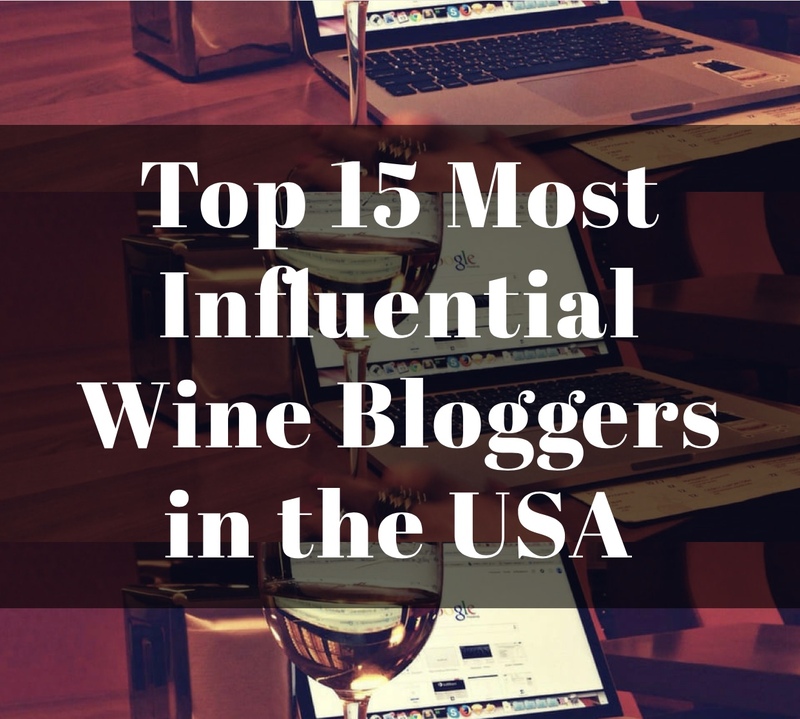 SBC is a fantastic area for wine! I do recommend you spend more time there and dine at HPII. I can’t wait to hear what you think. Cheers! .. BTW … and 2 hours north (Paso Robles) was outstanding. It was a fun trip. I highly encourage you to spend sometime in SBC. Dinner at the HPII was fun and delicious.